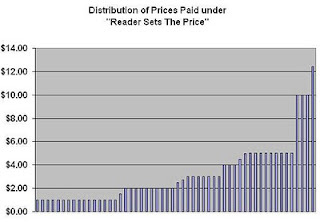 Smashwords: What Happens When Ebook Customers Choose Their Own Price? happy birthday, and thanks for the breakdown - very interesting. That fits with my own experiences. The Radiohead 'experiment' was more a very clever marketing stunt than an attempt to redefine a business model. The band used 'free' to drive sales of physical format product, which was a special edition box set including vinyl records of all things. Cost? 100 quid. Trent Reznor has also successfully used free to drive physical format sales. But these are established, *very* well known recording artists. I have argued for some time that free is not a viable business model. Thanks for compiling the stats; they're important. Every time someone pays for the book via You Set the Price it restores my faith in humanity. I'm totally fine with people downloading it for free - that's the point - but it's nice when people pay something when they don't have to. Says a lot. My best take is $5.00. I have to say that if books are offered for free, most of the time I download them (and will eventually read them). But when someone says, please pay what you think this is worth, I pay. If there is a suggested price for a book (.99, 2.50, etc.) I think that it is right to pay that price. 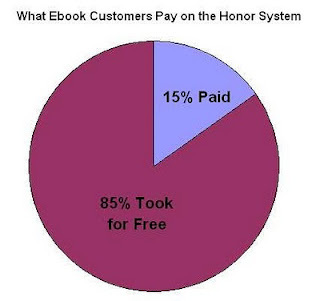 I like ebooks that are 9.99, but if the ebook costs more, and I really want it, I will pay for it. Also, I freaking hate bad formats and books that are hard to access. I have totally given up on certain sites because of the hoops you have to jump though. The question that can't be answered is how many of those who downloaded without paying read the book? I've seen a lot of people who will take something that is free yet for which they have no use. If someone downloads, but doesn't read, has the author lost anything? OK- I will give it a try! Very interesting. The next time you look at these numbers, would you also look at the number of purchases? While the author clearly gets less money for the average download here, it would be good to see if the total number of downloads increases, and by how much. Thanks! Great series of data based posts! One question I had was how does this compare with the average $ price sitewide. As in when you take the paid for downloads and the free downloads what is the average price for all downloads. Is the honour system encouraging a higher average? I doubt it, but it would be nice to check. Happy birthday, Smashwords! Hmm, I've just realised that in three weeks' time it'll be the first anniversary of my joining the site. What a year it's been! Really nice, it is full of knowledge. i like it very much. thank you. Can you tell me how this option could be selected in Smashwords ? I was struggling to understand how to do it. There needs to be the option to go back an pay after you have read it. I picked zero because I did't know if it would be good or not and figured i could go back an buy it again with a payment if I liked it. A suggestion if you are not sure if you will like a "Choose your own price" book. Choose a low price or zero then read the book. If you really like it then purchase another as a gift to a friend at an appropriate price. Also be sure to write a review. I know as an author I am pleased to get an additional reader (who probably would not have purchased it otherwise) and a nice review is always appreciated.